Whatever toothbrush you choose, make sure to brush your teeth twice each day. Soft bristles, medium bristles or cartoon character-covered. So many toothbrush choices and potentially so much confusion. With a dizzying array available today, you also may be wondering which is better — manual or electric? Affordability – Invented in 1938, the manual toothbrush has kept the mouths of untold numbers of people healthy for years. This no-frills type of teeth scrubber is wallet-friendly. Portability – Unlike electric toothbrushes, which tend to be bigger and heavier, manual toothbrushes are easy to pack in your bag on your next trip. Kid-friendly – Small children can learn to safely and effectively brush their teeth with a manual toothbrush. Plus, you’re probably more likely to find your kids’ beloved characters on a manual toothbrush, which may encourage them to brush more. Good for the lazy brusher – For those who look at brushing teeth as a chore (perish the thought! 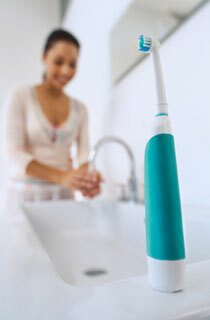 ), an electric toothbrush does the work for you. Fights Gum Disease – Because an electric toothbrush can easily get those hard-to-reach spots in your mouth, it may help remove more plaque and reduce the risk of gingivitis or gum disease. Ideal for Those With Less Dexterity – Older adults, in particular, or those with arthritis may find it challenging to effectively clean their teeth with a manual brush. When dexterity is diminished, an electric toothbrush is a good option. Whether you prefer manual or electric, it’s important to make sure that the bristles of your toothbrush aren’t worn down. How do you know when it’s time to replace your brush? When the bristles appear bent versus straight and rigid. Manual or electric? You decide. Both can do a terrific job of keeping your teeth clean and cavity-free. We also encourage you to schedule regular checkups with our practice to ensure optimal oral health.